■Experience the award winning gameplay and match excitement from console on mobile! From the 8,000+ player animations, to the team characteristic playstyles, and even the thrill of taking on your opponent--everything is the same! You'll also find that player personalities are more distinct than ever before, thanks to the addition of new skills, playstyles, and goal celebrations. 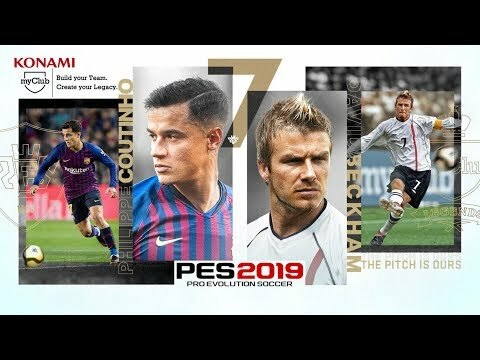 ■Compete with friends and battle against the world with PES 2019! Play against friends and users all over the world in a variety of ways with PES 2019! Once you feel ready to take on the world, you'll be able to challenge all users with "Online Match" mode. Get your team prepared for the global challenge by taking part in weekly events where you'll be able to win different types of rewards, allowing you to train your teams and vie for world dominance. Exclusive Legend players like Beckham, Zico, Romario, and world renowned legends like Cruyff, Nedved, Gullit, Maldini, and Kahn will continue to appear in PES 2019. New Legends will also be added throughout the season, allowing you to play with the best players, past and present! Keep up to date with the fast moving world of soccer to ensure that you're a step ahead of the competition!